(a) Install the No. 1 cooler thermistor as shown in the illustration. Be sure to insert the thermistor only once because reinserting it into the same position will not allow it to be firmly secured. When reusing the evaporator, insert the thermistor one row next to the one that has been used previously (X in the illustration). After inserting the thermistor, do not apply excessive force to the wire. 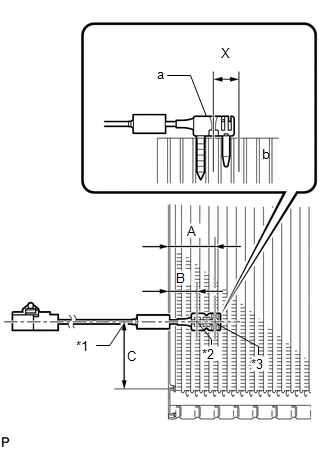 Directly insert the thermistor until the edge of plastic case "a" comes into contact with evaporator "b".